Archangel Gabriel is known as the angel of revelation because God often chooses Gabriel to communicate important messages. Gabriel's name means "God is my strength." Other spellings of Gabriel's name include Jibril, Gavriel, Gibrail, and Jabrail. People sometimes ask for Gabriel's help to clear away confusion and achieve the wisdom they need to make decisions, obtain the confidence they need to act on those decisions, communicate effectively to other people, and raise children well. Gabriel is often depicted in art blowing a horn. Other symbols that represent Gabriel include a lantern, a mirror, a shield, a lily, a scepter, a spear, and an olive branch. His light energy color is white. Gabriel plays an important role in the religious texts of Islam, Judaism, and Christianity. “Who is an enemy to Gabriel! For he brings down the (revelation) to thy heart by God's will, a confirmation of what went before, and guidance and glad tidings for those who believe." In the Hadith, Gabriel again appears to Muhammad and quizzes him about Islam’s tenets. Muslims believe that Gabriel gave the prophet Abraham a stone known as the Black Stone of Kaaba; Muslims who travel on pilgrimages to Mecca, Saudi Arabia kiss that stone. Muslims, Jews, and Christians all believe that Gabriel delivered news of the upcoming births of three famous religious figures: Isaac, John the Baptist, and Jesus Christ. So people sometimes associate Gabriel with childbirth, adoption, and raising children. Jewish tradition says that Gabriel instructs babies before they’re born. In the Torah, Gabriel interprets the prophet Daniel’s visions, saying in Daniel 9:22 that he has come to give Daniel “insight and understanding.” Jews believe that, in heaven, Gabriel stands beside God’s throne at God’s left hand. God sometimes charges Gabriel with expressing his judgment against sinful people, Jewish beliefs say, as God did when he sent Gabriel to use fire to destroy the ancient cities of Sodom and Gomorrah that were filled with wicked people. 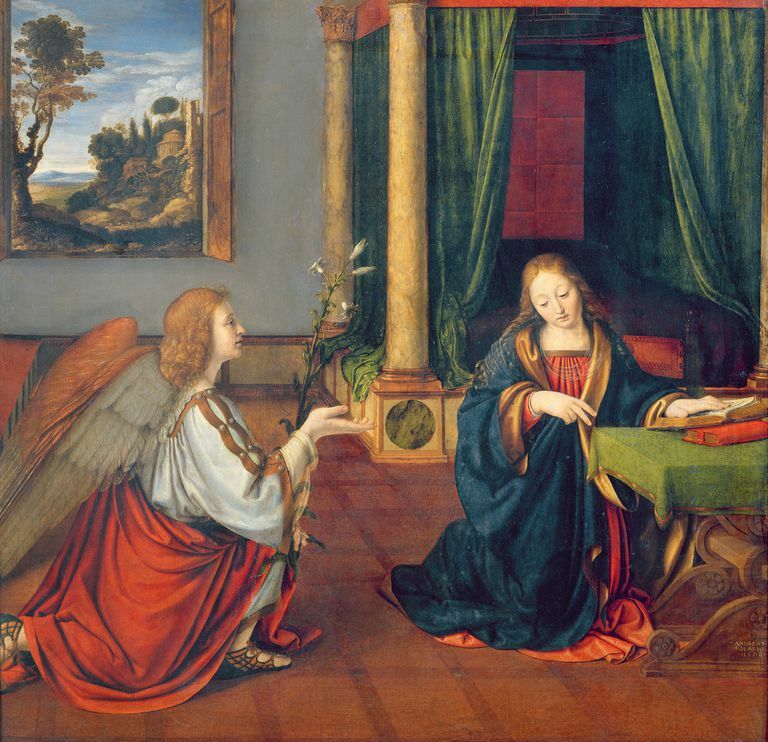 During the same visit, Gabriel informs Mary of her cousin Elizabeth’s pregnancy with John the Baptist. Mary’s response to Gabriel’s news in Luke 1:46-55 became the words to a famous Catholic prayer called “The Magnificat,” which begins: “My soul magnifies the Lord and my spirit rejoices in God my savior.” Christian tradition says that Gabriel will be the angel God chooses to blow a horn to wake the dead on Judgment Day. The Bahai faith says that Gabriel is one of God’s manifestations sent to give people, like the prophet Bahá'u'lláh, wisdom. People from some Christian denominations, such as the Catholic and Orthodox churches, consider Gabriel a saint. He serves as the patron saint of journalists, teachers, clergy people, diplomats, ambassadors, and postal workers.